A single species is recognized in this genus. 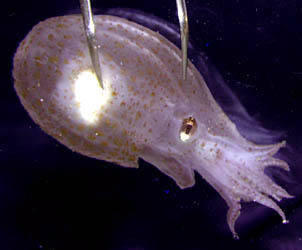 Bolitaena pygmaea is a small, lower mesopelagic to bathypelagic octopus. It is very similar in appearance to Japetella as small subadults but is distinguished primarily by the smaller eyes that are set on longer optic stalks. with a ligula on the hectocotylus. with small eyes on long optic stalks. Left arm III hectocotylized in males with an elongate ligula. Third right arm sexually dimorphic with 1-3 greatly enlarged suckers in males. Figure. Male B. pygmaea. Left - View of right side showing enlarged sucker. Drawing from Chun, 1910. 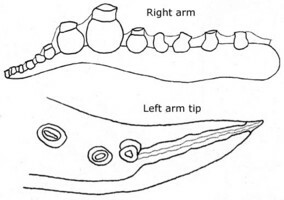 Right - Side view of the right arm and oral view of the left arm tip showing ligula. Drawings from Thore (1949). Well removed from brain on long optic stalks. The distinctive hectocotylus makes identification of nearly mature males easy. Unfortunately these males are rarely seen. As a result, separation of this species from Japetella diaphana depends largely on the differences in eye size and length of the optic stalks. Near sexual maturity, iridescence of the digestive gland and eyes is lost; pigmentation greatly increases in females, and arms become relatively longer. In addition, the posterior salivary glands of males become greatly enlarged (Voight, 1995). Females develop a yellow ring-shaped light organ around the mouth. Gravid females and nearly mature males (mature males are unknown) are found at the lower end of the vertical distribution range near 1200-1400 m. Brooding females, however, are found near 800 m off Hawaii. Figure. Oral view of the brachial crown of B. pygmaea showing photophore, mature female, Northwest Atlantic. Photograph by M. Vecchione. Hatchlings have a ML of about 2 mm and eggs are about the same length (Young, 1972). The early paralarvae of Bolitaena pygmaea have an abundance of chromatophores that easily separates them from Japetella diaphana if specimens are intact which they usually are not. The optic lobe of the brain is distinctly separated from the brain by a short optic stalk even in the paralarva. In Japetella diaphana paralarvae no such separation is apparent. Figure. Dorsal and ventral views of a paralarva of B. pygmaea, 3.9 mm ML. Drawing modified from Hochberg, et al. (1992). Females, brooding clusters of interconnected eggs, float at a depth of around 800 m where downwelling sunlight is too low to reveal their presence. This is about as close as they can get to the surface in Hawaiian waters under this visibility constraint. Females do not feed while brooding and apparently die after the young hatch (Young, 1972). At a temperature of 4-5°C, brooding is expected to take at least several months. Hatchlings either swim upward to about 200 m depth where food presumably is more plentiful or are carried there by the female at the time of hatching. Young Bolitaena descend into mesopelagic depths as they grow, but the size at which they descend is variable (ca. 5-15 mm ML). At maturity the octopus descends to depths of about 1400 m where males probably first attract females then females attract males. Secretions from the enlarged posterior salivary glands of males could secrete pheromones to attract females (for an alternate view of the function of the enlarged salivary glands, see Voight, 1995). Presumably, as the female draws close and considers conditions safe, she will signal the male with the oral light organ and mating will occur. In waters off Hawaii, Young (1978) found the distribution pattern shown on the right. Small octopods (ca. 5-15 mm ML) were found near 150-200 m depth or mostly below 600 m. One gravid female was captured at 1400 m. Two nearly mature males were taken at 1200 and 1425 m. Four brooding females were taken between 800 and 900 m.
Figure. Vertical distribution of B. pygmaea off Hawaii. Bars - Fishing range of opening/closing trawl; absence of bar indicates capture is from an open trawl. Circles- Modal depth of the trawl. Open yellow circles- Day captures. Filled blue circles- Night captures. Red dots with yellow cross-bars- Brooding females, day captures. Red dots with blue cross-bars- Brooding females, night capture. Red dot with green ring- Gravid female. Chart redrawn from Young, 1978. This is a tropical-subtropical species found worldwide (Thore, 1949; Nesis, 1982). Chun, C. 1910. Die Cephalopoden. Oegopsida. Wissenschaftliche Ergebnisse der Deutschen Tiefsee Expedition auf dem Dampfer "Valdivia" 1898-1899, 18(1):1-401. Robison, B. and R.E. Young. 1981. Bioluminescence in pelagic octopods. Pac. Sci., 35:39-44. Thore, S. 1949. Investigations on the "Dana" Octopoda. Dana-Report No. 33: 1-85. Young, R. E. 1972. Brooding in a bathypelagic octopus. Pacific Science, 26: 400-404. Young, R. E. 1978. Vertical distribution and photosensitive vesicles of pelagic cephalopods from Hawaiian waters. Fish. Bull. 76: 583-615.